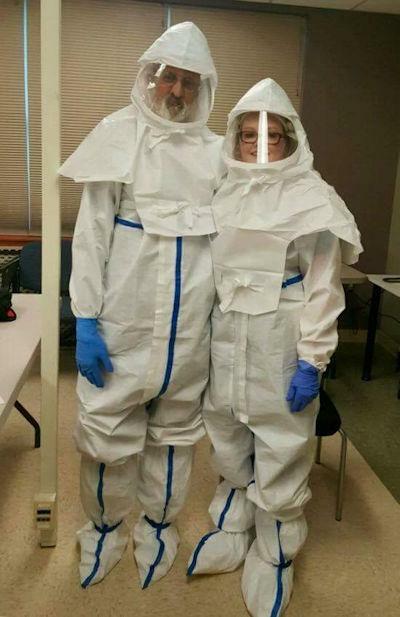 Ricky Taylor, formerly with Allegiance, (left) and Kelly Hamilton, a Respiratory Technologist at CHI St. Luke�s Health-Livingston, (right) participated in the training for High Consequence Infectious Disease Personal Protective Equipment (PPE), sponsored by SETRAC. CHI St. Luke’s Health-Memorial Livingston ED Participates in Infectious Disease Training, LIVINGSTON, April 4, 2017 - The CHI St. Luke’s Health-Memorial Livingston Emergency Department, local EMS and Southeast Texas Regional Advisory Council (SETRAC) teamed up this month to provide highly specialized training on how to stay safe when caring for patients with extremely infectious diseases. Organized by the Texas Department of Health, SETRAC provides support to surrounding trauma centers like Livingston with free training, as well as resources and supplies in the event of a disaster or major trauma situation. Memorial Livingston’s Emergency and Trauma Coordinator Karen Pollard said Tetra Technologies and SETRAC recently trained her team, along with local EMS, on how to use High Consequence Infectious Disease Personal Protective Equipment (PPE). Pollard said the head-to-toe white suits would only be used if a patient arrived at the hospital showing symptoms of a highly infectious disease, such as Ebola. Pollard said it’s important for her team to be involved with continuing education, and organizations like SETRAC help make that possible.